Wishing you all a very Happy new year and hope that the year that passed by was quite fruitful. If you are all wondering where I had been for the past months I had to take an indefinite break not only from blogging but also from several other activities which were quite close to my heart. I met with an accident and I had to stay off my feet for few months. But now I am Okay and doing well and I am back to my earlier activities though with strict instructions from my Doctor not to over do it. It had been months since I sat at my computer and it feels great now that I do. As I will be celebrating my 100th post shortly I thought of announcing my first event of my blog. As winter has descended upon us with a vengeance we all crave for snacks during the tea time. Our hearts long for some hot samosas or chips or whatever crisp along with our hot steaming mug. Only the more crispier and hot, the better. So I thought making this as my theme for the event. 1. Cook any item of your choice, be it a snack or a starter and post it in your blog, the only criteria being that it has to be deep fried in fat. Up to 3 entries are accepted. 2. Only vegetarian recipes please (eggs not allowed). 5. If you have any archived posts featuring the above said theme, you could very well send them over after reposting them linking back to this post. 6. Non bloggers can e-mail me your with the picture and I will include it in the round up by sending an e-mail to me. 7. Please send in your entries before February 5, 2011. The round up will in the following week. Hope I have covered all the points. Feel free to contact me in case of any doubts. and participation to make this event a grand success. 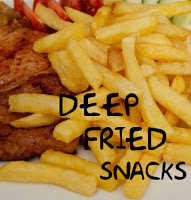 You can find the array of Deep Fried Snacks Here. Nice event Radhika…deep fried snacks is definitely something I can’t resist(when you eat forget the calories…u can always exercise later:)Would definitely try to send in an entry. Looking forward to the spectacular round up. It is cold all over the place and there could be no better timing for this event Radhika. Happy Hosting & will try to send something for you. Would love to send some of my snacks for the event. Best wishes, happy 2011 to you! Will sure send in my entries,happy hosting and Happy New Year Radhika! Nice event. Will try to send in something. I have included your event in my Food Blogs Event Calendar. I have sent some recipes to ur event..
Nice event. Wl def send my entries..
nice event in winter fried snacks are liked by everyone. 1st time here..lovely blog and gald to follow you.. I am sure in… will definitely participate. just sent u an entry but got a msg that i am waitlisted… let me know when u get the email. thnx! Thanks for the message. I’ll try to get some fried food for this event. Nice event,i will try to send a few..
Nice event and happy hosting…. have sent you one entry. hope you will like it. All the best! Spoonfuls of love, added to every recipe !!! Happy Hosting Dear,will sure send my entry! I have sent my entry. I have sent you my entry. I have sent my recipe as well of Lehriya Mirch/mirchi samosa,Gobhi Manchurian and aloo methi pakoda!!!! Tried sending you my entries…but there was a failure notice. I am not sure whether you received them?? I am not able to send you my entry. I am giving you the link here. Accept it here itself. I am sorry I checked in late :(( I have the perfect entry for this one… Can i still send it in?